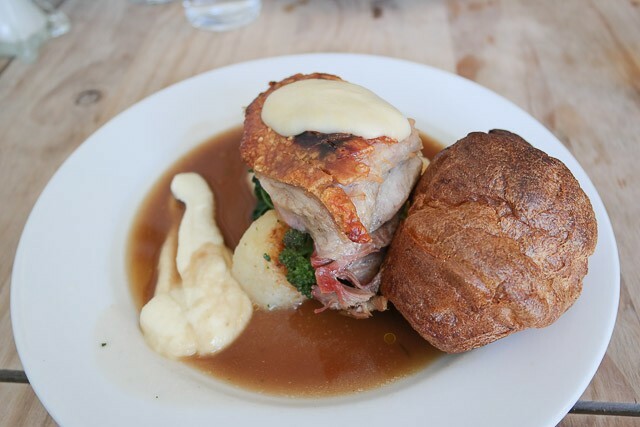 We wanted to visit the beach one weekend and as we had such a great time at The Pearsons Arms in Whitstable last year, we thought it might be worth visiting the area again. After a bit of research, I decided on The Oxford. I gave them a call and booked a table for 1pm the following Sunday. 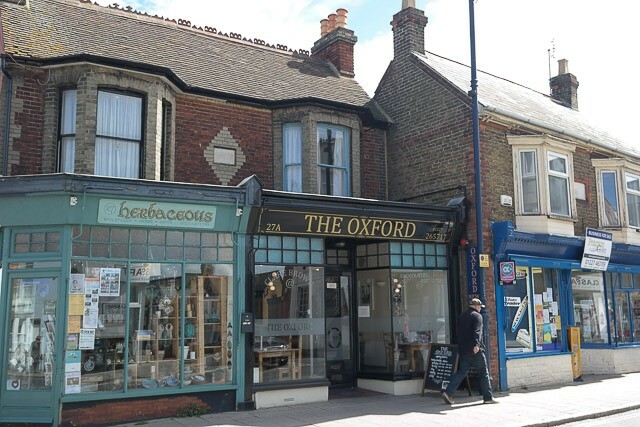 The Oxford is a small restaurant on the main road, I actually drove past it a few times before we found it. There wasn’t any parking at the venue, so found a space in a nearby car park (as before, best to get to Whitstable early as parking spaces are a premium). We were the first people for service (in fact we arrived half an hour early for our booking). The restaurant had a nice and airy feel, with large shop front windows out on to the street. Jazz was playing over the speakers, photo art in frames dotted around the walls and, along with the tulips on the table, gave the impression of a smart and relaxed venue. The table was laid out, with paper napkins (I seem to be commenting on this with each review now). Processco for Claire. I was undecided with regards a drink for me – the waiter recommended a Wantsum Dynamo – a good choice. We also had some table water in an funky bottle. We skipped starters and went straight to the main course. The menu was written in white on a black part of the wall. The waiter was very knowledgeable with regards the food and menu options. Claire ordered a Roast Beef for both herself and JW (our toddler). I ordered the Pork Belly. 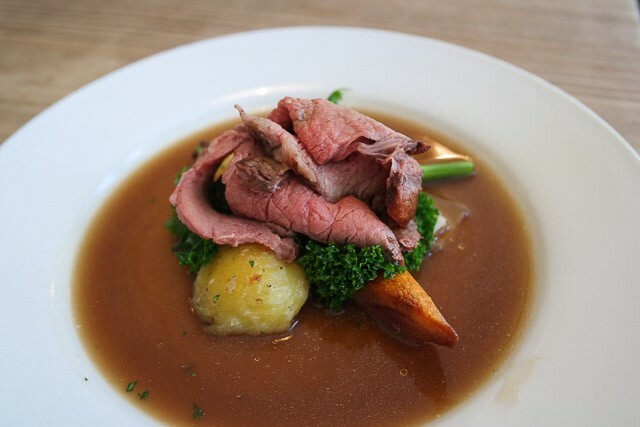 The beef was nice, it had some seasoning on top giving the flavour a bit of depth. Although the crackling was crispy and enjoyable, the pork belly wasn’t very good – the fat hadn’t fully melted so Claire wasn’t able to eat most of it. 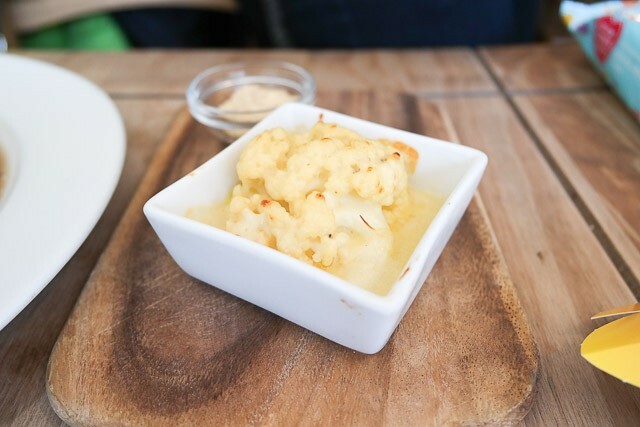 The Oxford knew how to cook cauliflower cheese, it had a lot cheese! The roast potatoes were not crispy at all, but well seasoned. Continuing with the vegetables, the leek was cooked nicely, and al dente broccoli is almost always tasty. Overall, a strong vegetable selection and roast beef, but let down by the poorly cooked pork belly. 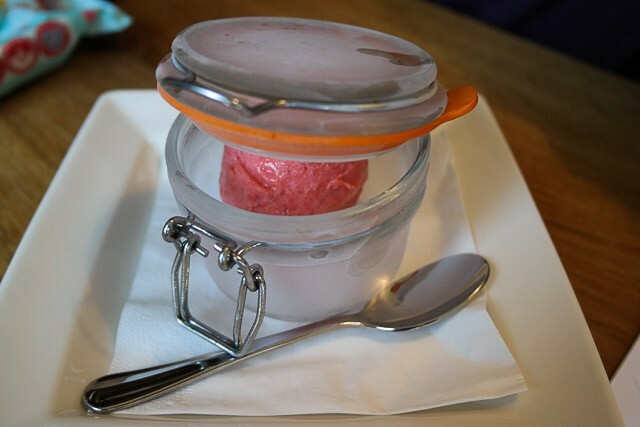 As JW was off gluten and dairy, we ordered a blood orange sorbet (this was not on the menu). Claire ordered the delicate sounding Lemon Posset with Rhubarb, I asked for the Sticky Toffee Pudding. 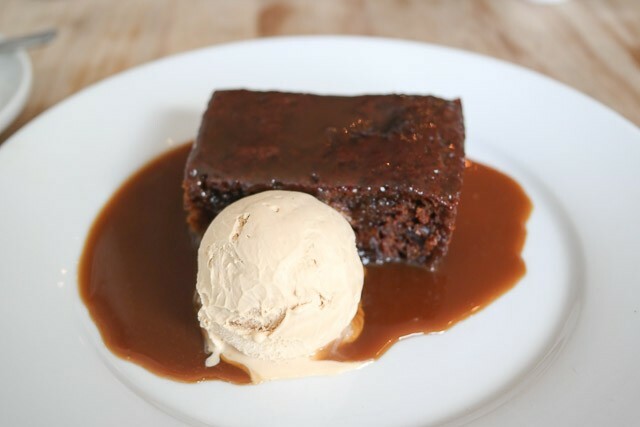 The sticky toffee pudding was quite a light dish with some very nice ice cream (it was supposed to be vanilla, but was in fact toffee). 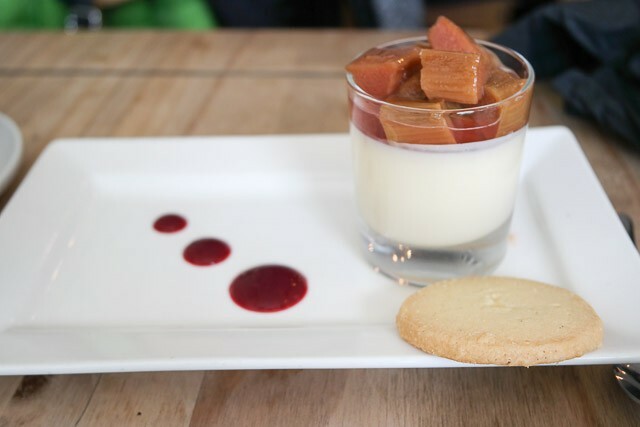 The lemon posset dessert was not as delicate as Claire thought it would be – lemon flavours were completely overpowered by the rhubarb. JW really liked the blood orange sorbet. I was pleased we could order JW a Sunday lunch, although £9.50 is perhaps a bit too steep. The highchair was very solid and clean. The toilets were outside, I didn’t see any baby changing facilities. Personally, I feel that The Oxford is more suited to older children rather than babies and toddlers. I had high hopes for The Oxford, reviews online were very complimentary. The waiter was knowledgeable but as he was managing the whole room, I didn’t feel we received attentive service (ie no “goodbyes” when we left). Whilst the food was quite nice, especially the beef, cauliflower cheese and vegetable selection, it was very much let down by the pork belly. Also, as a warning, they do not allow tips on cards. 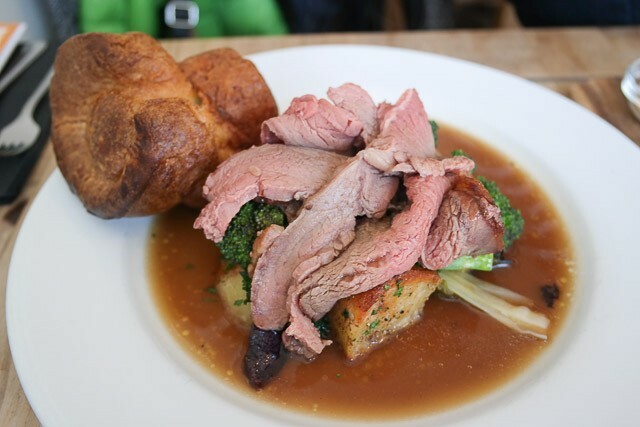 Overall then, an above average Sunday lunch, perhaps best suited to couples or families with older children.